The Scottish National Portrait Gallery in Queen Street, Edinburgh opened in 1889 and underwent a major refurbishment in 2009 to 2011. The refurbishment included improving a frieze which goes round the Main Hall of the Gallery below the first-floor balustrade. It was created by the artist William Hole in 1898 and depicts 155 men and women deemed in the late 19th century as the greatest in Scottish history. Although photography is not allowed in the rest of the National Portrait Gallery, it is permitted in the main hall. The pictures in this page (starting above) are of the chronological sequence (running backwards in time) of the figures in the paintings. Note that the pictures here overlap to a certain extent in order to ensure that all the historical characters are included. You may find it useful to see the various historical figures with their contemporaries. 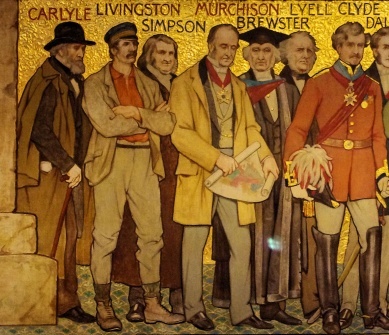 Sir Roderick Impey Murchison, geologist; Sir David Brewster, natural philosopher; Sir Charles Lyell, geologist; Sir Colin Campbell, Lord Clyde, Field-Marshal; James Andrew Ramsay, 10th Earl and 1st Marquess of Dalhousie, Govenor General of India; Thomas Babington, Lord Macaulay, historian and statesman; Professor Sir William Hamilton, metaphysician; Henry Peter Brougham, 1st Baron Brougham and Vaux, statesman; Rev Thomas Chalmers, social reformer; Sir David Wilkie, painter; Rev John Thomson of Duddingston, landscape painter; Thomas Cochrane, 10th Earl of Dundonald, Admiral; Robert Stevenson, lighthouse engineer; Professor Dugald Stewart, philosopher; Henry Dundas, 1st Viscount Melville, statesman; Thomas Campbell, poet and critic. James Kennedy, Bishop of St Andrews, statesman; Robert Boyd, Lord Boyd, statesman; Marie of Gueldres Queen of James II; Sir William Crichton, Lord Crichton, Chancellor of Scotland; James II King of Scots; Sir Alexander Livingston, Guardian of James II; King James I King of Scots; Joan Beaufort, Queen of James I; Donald Macdonald Lord of the Isles; David Stewart Duke of Rothesay, eldest son of Robert III; Robert III Governor of Scotland; Robert Stewart, Duke of Albany, Governor of Scotland; John Barbour, poet and author of "The Bruce"; Archibald, 3rd Earl of Douglas, Lord of Galloway and Guardian of Scotland; Robert II King of Scots 'The Steward'. Gruoch, Queen of Macbeth; Duncan I King of Scots; Three Vikings; Kenneth MacAlpine, Kenneth I First King of Scots; St Cuthbert, Prior of Melrose; St Adamnan, biographer of St Columba; St Columba, founder of Iona Monastery; St Aidan, missionary and bishop to Northumberland; Brude, 1st King of the Picts; St Kentigern (or Mungo), Patron Saint of Glasgow; Rederech, King of Strathclyde; A Druid; St Ninian, first Christian missionary to Scotland; Theodosius, Roman General.